Stories of Lloyd George - his charisma and his oratory skills. Clip has interviews with 2 friends who knew Lloyd George well. They remember his fantastic oratory skills and note how he used his body to dominate a crowd despite not being a very large man. A speech he made in 1909 in Caernarfon is quoted from, showing his abilities as a speech-writer. Born 17 January 1863 at Chorlton-on-Medlock, Manchester, Welsh speaking Lloyd George was the first and so far only Welsh politician to hold the office of British Prime Minister. He was brought up in the north Wales village of Llanystumdwy where his widowed mother lived with her brother, the village cobbler. 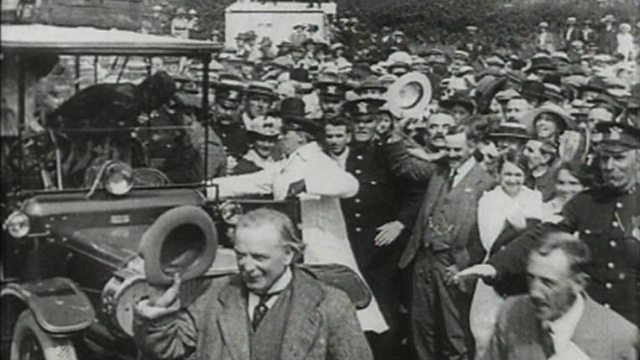 David Lloyd George audio and video archive. Highlights of favourite BBC Wales programmes reflecting the story of Wales and its people.